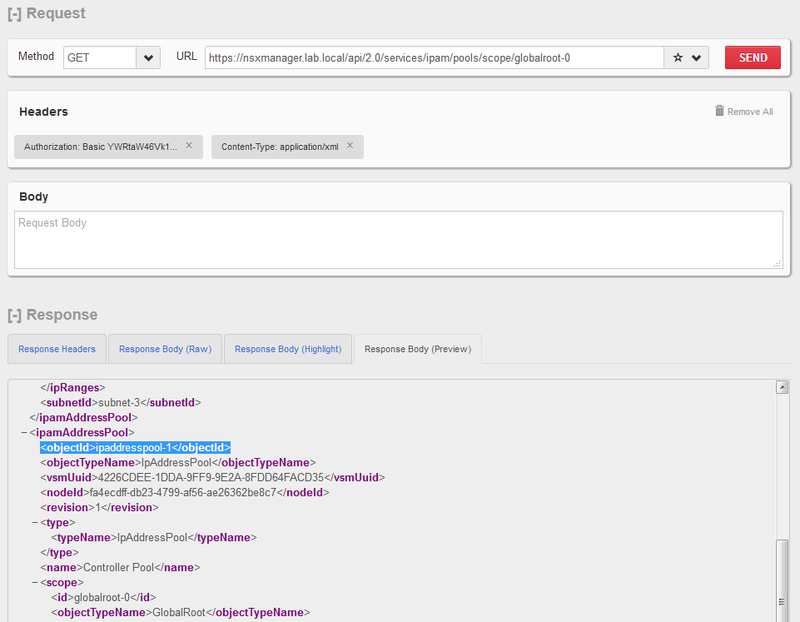 Using NSX REST API calls to modify ESG/DLR configuration that isn’t exposed in the UI. If you are reading this post, you’ve probably already come to the realization that the ‘Tenant’ field for ESGs can’t be changed in the UI. Once the appliance is deployed, this string value appears set in stone. Adding the Tenant and Description are easy during deployment, but can’t be changed in the UI after deployment. Although it can’t be modified in the UI without creating a new appliance from scratch, it’s pretty easy to modify this field via REST API calls. After having come across a question on the VMware communities forum regarding this, I thought I’d write a quick post on the process. First, you’ll need to do a GET call to retrieve the current ESG/DLR configuration in XML format. I won’t cover the basics of REST API calls in this post as the topic is well covered elsewhere. If you’ve never done REST API calls before, I’d recommend doing some reading on the subject before proceeding. I’ll be using the popular Postman utility for this. First, we’ll need to find the moref identifier of the ESG/DLR in question. We’re interested in mercury-esg1, which is edge-4 in my lab environment. You can easily find this from the ‘Edges’ view in the UI. In my case, I want to modify the edge called mercury-esg1, which is edge-4. Notice that someone put the string ‘test’ in as the tenant, which we want to change to ‘mercury’. I got a 200 OK response, with all the config in XML format returned. All of the ESG’s configuration was returned in XML format. This is everything needed to recreate or modify the appliance. I will simply change <tenant>test</tenant> to <tenant>mercury</tenant>. The final step is to take your modified XML configuration data and apply it back to the ESG/DLR in question. This is as simple as changing your REST API call from GET to PUT and pasting the modified configuration into the ‘Body’ of the call. Be sure to double check your configuration before sending the PUT call! If your call was successful, you should get a 204 No Content response. And there you have it – the tenant field has been updated. Unfortunately, I haven’t had any success updating the description field via API. The <description> tag appears to be ignored in this PUT call for some reason. If anyone has any success with this, please let me know. PS C:\Users\mike.VSWITCHZERO> $edge.tenant = "hello"
Edge Services Gateway update will modify existing Edge configuration. Proceed with Update of Edge Services Gateway mercury-esg1? NSX uses the concept of IP pools for IP address assignment for several components including controllers, VTEPs and Guest Introspection. These are normally configured during the initial deployment of NSX and it’s always a good idea to ensure you’ve got some headroom in the pool for future growth. NSX usually does a good job of keeping track of IP Pool address allocation, but in some situations, stale entries may be wasting IPs. There are a few ways you could get yourself into this situation – most commonly this is due to the improper removal of objects. For example, if an ESXi host is removed from the vCenter inventory while still in an NSX prepared cluster, its VTEP IP address allocation will remain. NSX can’t release the allocation, because the VIBs were never uninstalled and it has no idea what the fate of the host was. If the allocation was released and someone deployed a new host while the old one was still powered on, you’d likely get IP conflicts. Just this past week, I assisted two separate customers who ran into similar situations – one had a stale IP in their controller pool, and the other had stale IPs in their VTEP pool. Both had removed controllers or ESXi hosts using a non-standard method. If you have a look in the NSX UI, you’ll notice that there is no way to add, modify or remove allocated IPs. You can only modify or expand the pool. 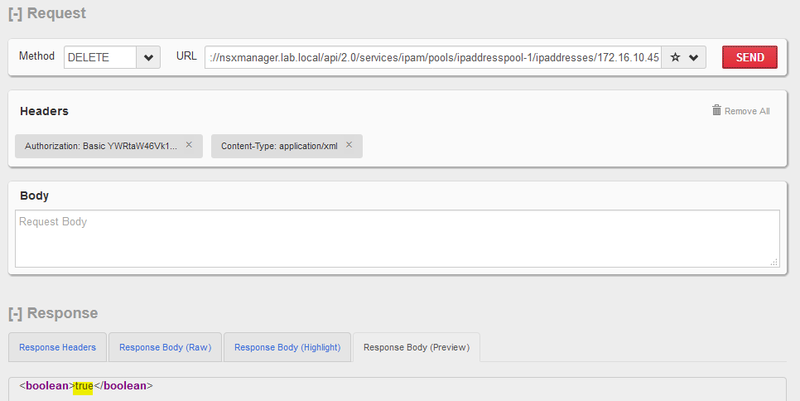 Thankfully, there is a way to remove allocated IPs from a pool using an NSX REST API call. To simulate a scenario where this can happen, I went ahead and improperly removed one of the NSX controllers and did some manual cleanup afterward. As you can see below, the third controller appears to have been removed successfully. So in order to get my third controller re-deployed, I’ll need to either remove the stale 172.16.10.45 entry or expand my pool to have a total of four or more addresses. If this were a production environment, expanding the pool may be a suitable workaround to get things running again quickly. If you are at all like me, simply having this remnant left behind would bother me and I’d want to get it cleaned up. Now that we’ve confirmed the IP address we want to nuke from the pool, we can use some API calls to gather the required information and release the address. The API calls we are interested in can be found in the NSX 6.2 and 6.3 API guides. My lab is currently running 6.2.7, so I’ll be using calls found on page 110-114 in the NSX 6.2 API guide. The IP address that needs to be released. The moref identifier of the IP pool in question. As you can see above, the ‘scope ID’ is also required to run this GET call. In every instance I’ve seen, using globalroot-0 as the scopeID works just fine here. As you can see above, the IP pool is identified by the moref identifier ipaddresspool-1. After a refresh of the vSphere Web Client view, the total used decreased to 2 for the Controller Pool and I could deploy my third controller successfully. Although this process is straight forward if you are familiar with running NSX API calls, I do have to provide a word of caution. NSX will not stop you from releasing an IP if it is genuinely being used. Therefore, it’s important to make 100% sure that whatever object was using the stale IP is indeed off the network. Some basic ping tests are a good idea before proceeding. Thanks for reading! If you have any questions, please feel free to leave a comment below.